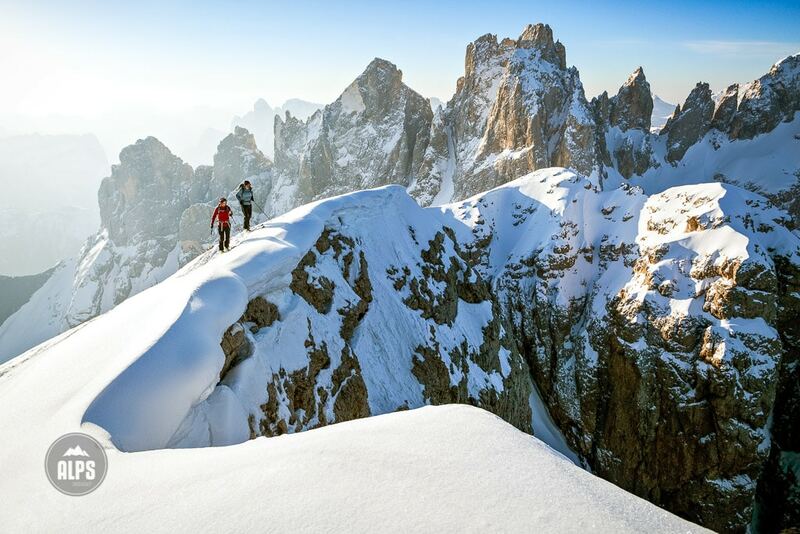 The Italian Dolomites are considered to be one of the world's most beautiful landscapes. True. They are also one of the world's great mountain playgrounds, famous for hiking, biking, running and skiing. 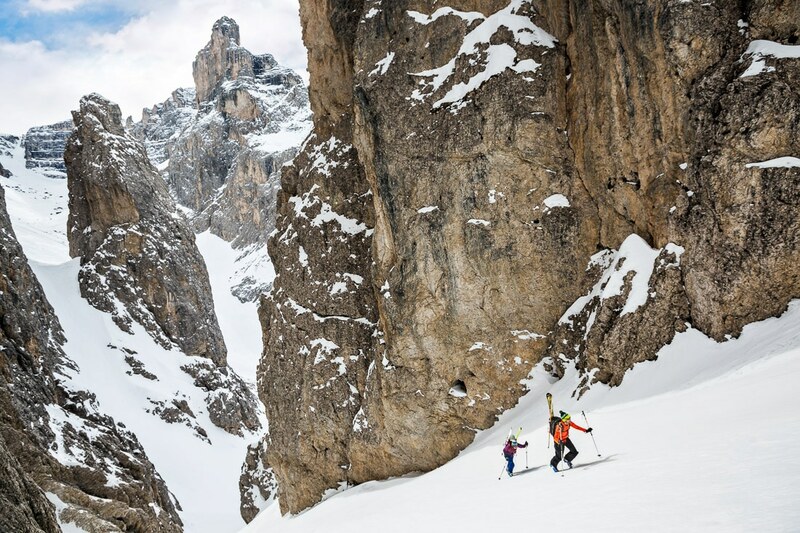 But the winter options include something special, and quite unique to the Dolomites - steep couloir skiing, in both great abundance and with relatively easy access. The Sella Massif, or Group is a massive island of Dolomite rock literally sitting as the heart of the Dolomite mountains. Around it is a road, famous to cyclists as the Sellaronda which links four valley villages and three languages; Italian in Arabba and Canazei, German in Grödental (Val Gardena) and Ladin in Alta Badia. The Massif itself looks like an enormous wedding cake, with tiers splitting its steep walls famous for rock climbing. But come winter, with the massif buried in snow - some new features take form and offer skiers the famous couloirs. Literally dozens drop into the valleys below, and with lift access to nearly the top of the Sella from Passo Pordoi, motivated skiers can easily do many couloirs each day. But there is a trick... finding them. A local mountain guide is just about mandatory to take full advantage of the offerings. You'll need to know what is in shape, or maybe even more importantly, what is not - so you don't find yourself in a nasty dead end because the snow didn't fill in the crux. I can't emphasize this enough - consider a guide! They'll not only get you to the couloirs, they'll know which ones you can ski based on your abilities. What makes couloir skiing so good? The places they take you and the lines you'll ski. Being in a couloir feels like being within the mountains themselves, you get yourself in, you need to get yourself out. After, you can sit, drink a beer and look up at what you were not on top of, as is usual, but what you were inside. This is a unique feeling. Alberto De Giuli Mountain Guide - a great friend and local. Holimites- close friends and tour operator specializing in mountain sports. 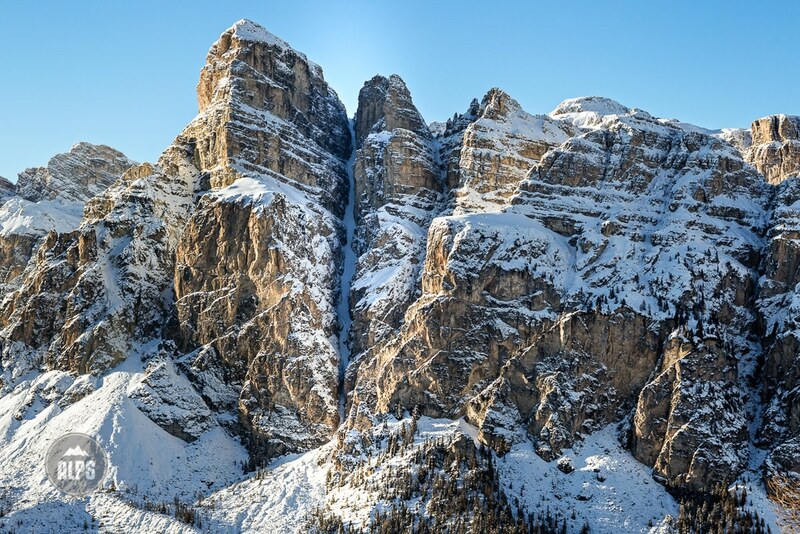 Sitting in the heart of the Italian Dolomites and rising above some of the region’s most famous villages is The Sella Group. Simply put, it takes your breath away. With its massive towers and labyrinth like corridors, it is a tremendous rock formation. 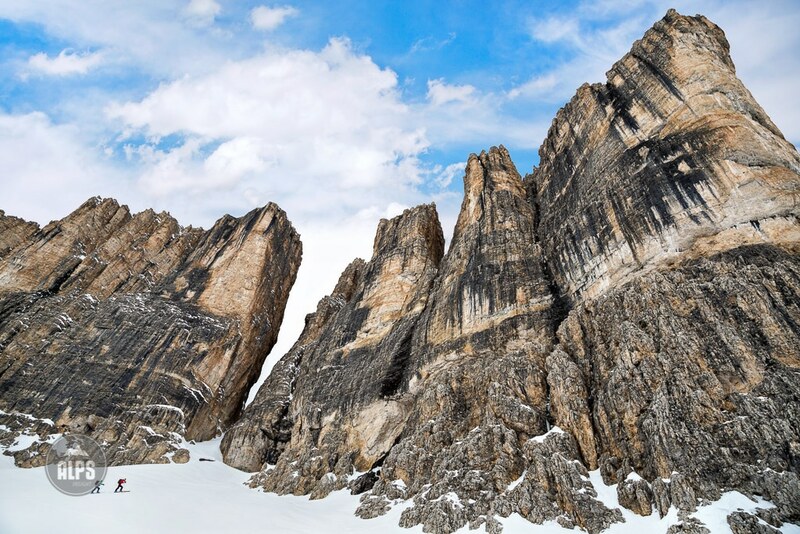 Consisting of many different peaks it is a complex structure: all sides are rocky and vertical, and yet the top is flat. At its base there are four valleys linked together by the most efficient lift system in the world. This circuit, all on groomed pistes, is called the “Sellaronda” and runs around this mountain offering unforgettable views on each side. 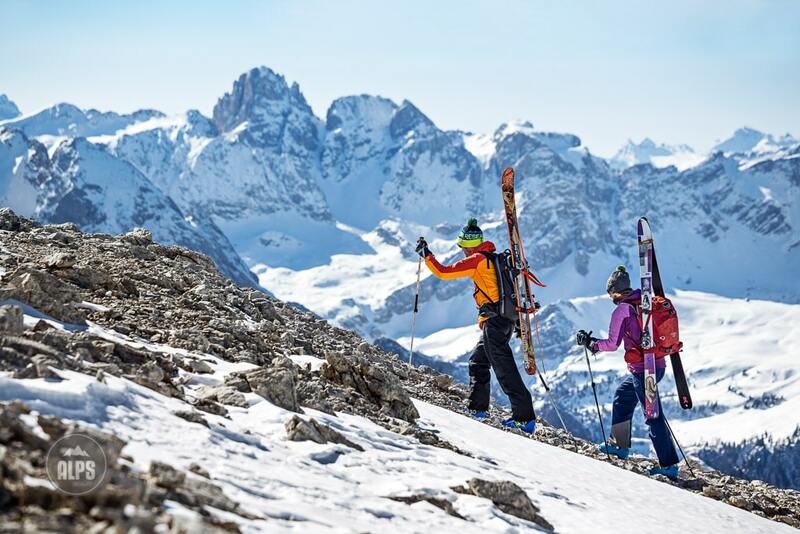 Skiers come from all over the world to spend a full day circumnavigating this island of stone on perfect alpine pistes. At first glance, it seems to be a mountain impossible to ski, but a closer look reveals many different “white snakes” coming down from the top plateau through the coloured walls. 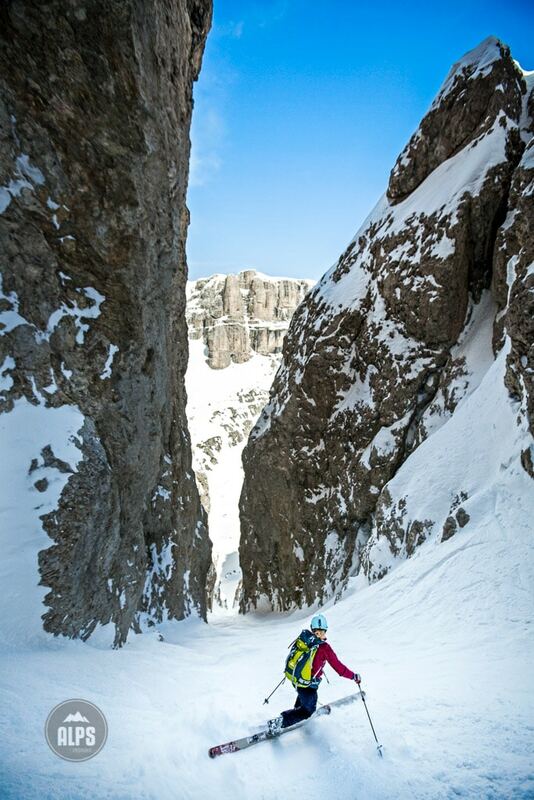 These are the famous couloirs of the Dolomites. The Sella is the best place if you want to know them and understand the feeling of couloir skiing. The Sass Pordoi cable car is the “door” of the kingdom and in only a few minutes we are on the top of the Altiplano, close to 3000 meters where the air is always cold and views to the Marmolada and beyond, stunning. A tourist asks us where are we going with skis, because there are no pistes here and from the terrace you can only see huge cliffs… He doesn’t know that it is possible to move on the Altiplano and reach many hidden off-piste descents. We start to ski on the flat summit of Sass Pordoi making the first track in 15 centimeters of fresh snow; the day is cold and sunny and I can feel the excitement of the guys who are skiing with me. The first turns are a good warm up and in few minutes we reach the forcella Pordoi; the temptation to ski the south couloir or the north side (Lasties Valley) without tracks is very strong, but our goal is Piz Boè at 3152 meters, the highest peak of the group. For this, it is always better to go before it will becomes too warm. We start to traverse toward the Mesdì valley, the most famous off-piste itinerary of the area, a kind of “Vallèè Blanche” of the Dolomites. But before its starting point we move right and start climbing with crampons on over the easy but rocky west ridge of Piz Boè. We’re headed for the little hut on the summit. Now it’s time for a rest, close to the wood wall of the hut where we are protected by the wind and where the sun is stronger. From here the view is unbelievable and we can see in distance other skiers walking to Mesdì Valley and a group skinning up to north side of the Altiplano toward the Setus Valley, one of the best traverse of the Sella group. In few minutes we start the ritual to get ready for the descent: crampons into the backpack, boots tightened, skis on, goggles, skipoles…rock and roll. The northeast face is wide and quite steep. Many people say that skiing a couloir is frightening, and here this is maybe a little true, because from where we start we can see the valley under your skis! It is time to find out.Thanks to the good snow, we all drop in and make perfect turns to reach the next starting point to the “Val delle Fontane”, an incredibly steep couloir which is hidden from the top. Here is the only possibility to ski down this side of Sella. We are lucky, the sun has softened the snow in just the right amount. 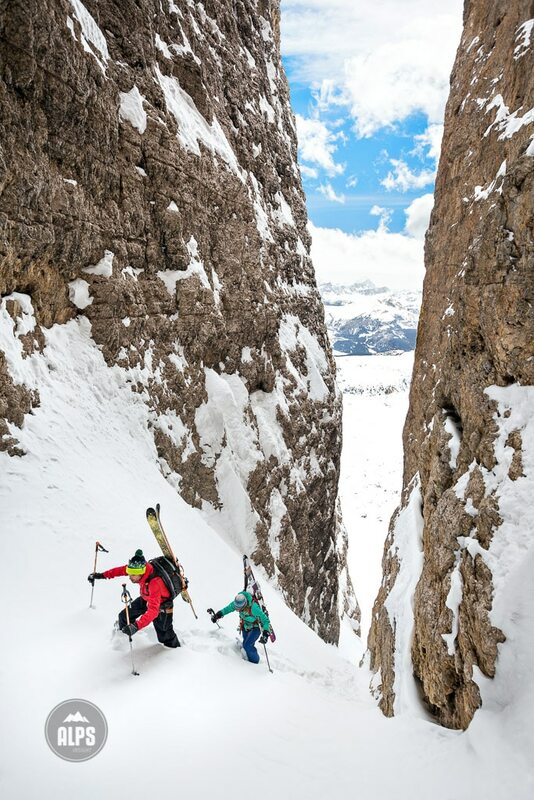 The couloir requires perfect snow for skiing. Thankfully, the rope remains in the backpack and we start to ski the 40° corridor with jump turns between the gold and orange walls. With blue sky above our heads, we all descend, smiling, to the valley. The ride is a pleasure and quickly the couloir is wide enough for longer turns. The skis move the surface of the snow drawing a perfect track behind. Stops are only for brief rests, to take pictures and to see the others in action (and to breathe! ), but we prefer not to stop too much or it feels as if our “dream” is escaping. At the end of the gully we have to traverse right to reach the open slopes; now it’s easier, there is no longer tension, but the snow is starting to be heavy …and our legs too. Once we reach the lifts at the bottom we look back up to see our tracks in the couloir. They always seem to be much steeper from this perspective and I can see the satisfaction in the eyes of my client. This brings me great joy, to reveal the passages that are hidden in this great mountain. 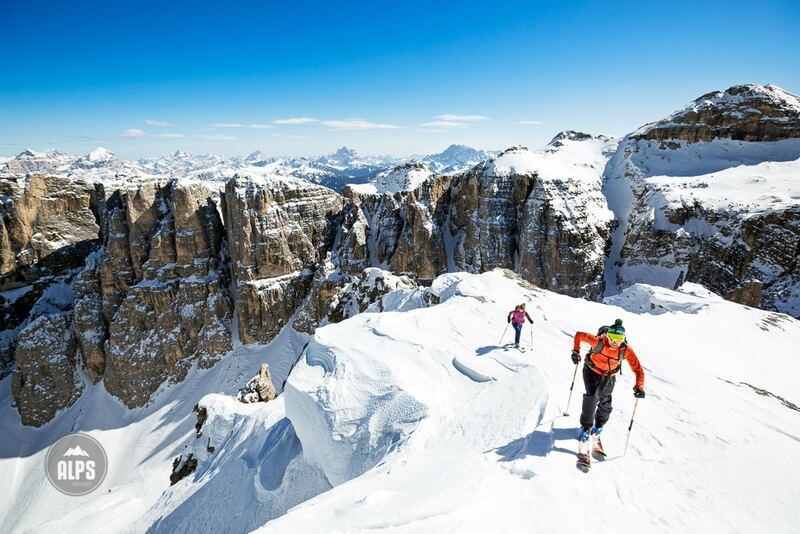 Francesco works with Corvara’s Alta Badia Guides School and specializes in steep skiing. He has countless hard descents to his credit, many with clients in both the Dolomites and the Alps. He is also the author of the new guidebook “Freeride in Dolomiti”, unarguably the finest guide for skiing in the Dolomites. TIP: To maximize fun levels, hire yourself a local mountain guide. Get to know the Ladin region of the Val Badia for it is a small, isolated language and culture. Try the local dishes, like cajenci or tutres - both ravioli like. Also, the region is famous for speck and a cracker-like bread called schüttelbrot. The top of the Sella Massif reveals all the many couloirs splitting the walls, many of which are ski lines. Heading for the Vallon Couloir, a small climb on one side, a long drop on the other. 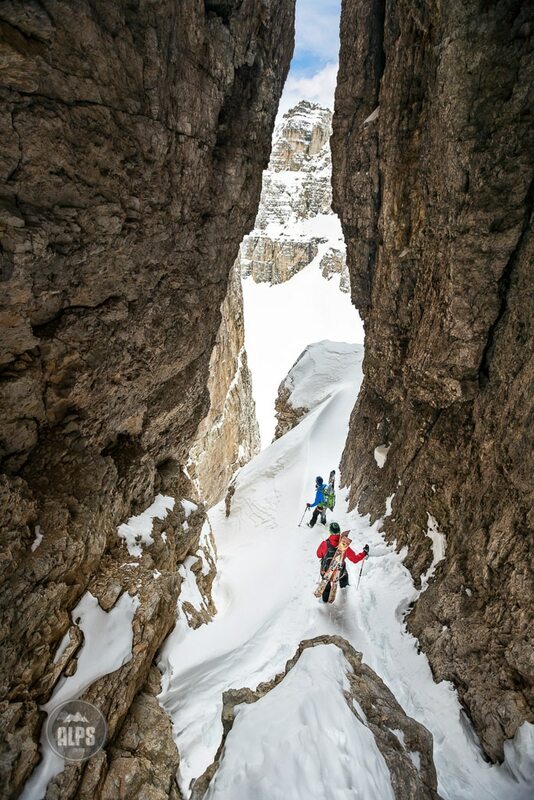 Just to access the ski line, the Vallon's notch includes a tunnel through intricate terrain. Rappelling into the Vallon Couloir. Hiking to find the access points on top of the Sella Massif. 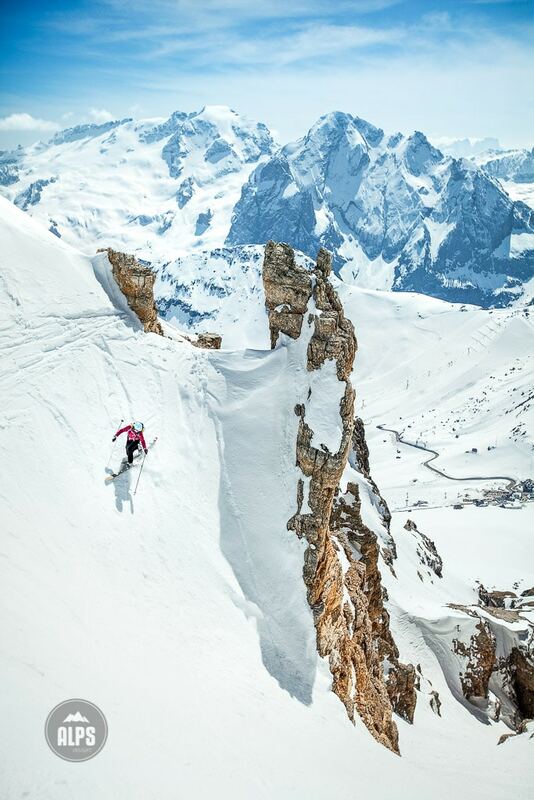 Looking into the most famous ski descent of the Dolomites, the Val Mesdi. Arguably the most classic of them all, Val Scura above Val Badia. The San Martino di Castrozza Group. 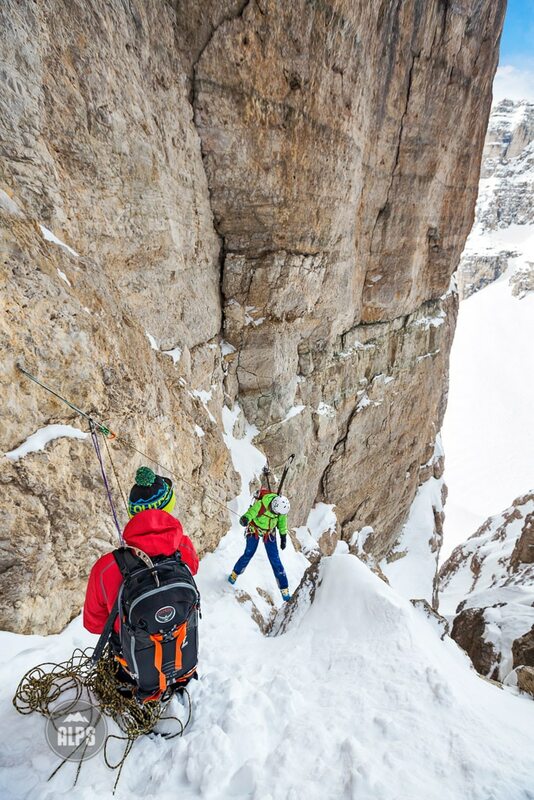 Dropping into the Joel Couloir in the Sella Group, high above Passo Pordoi. 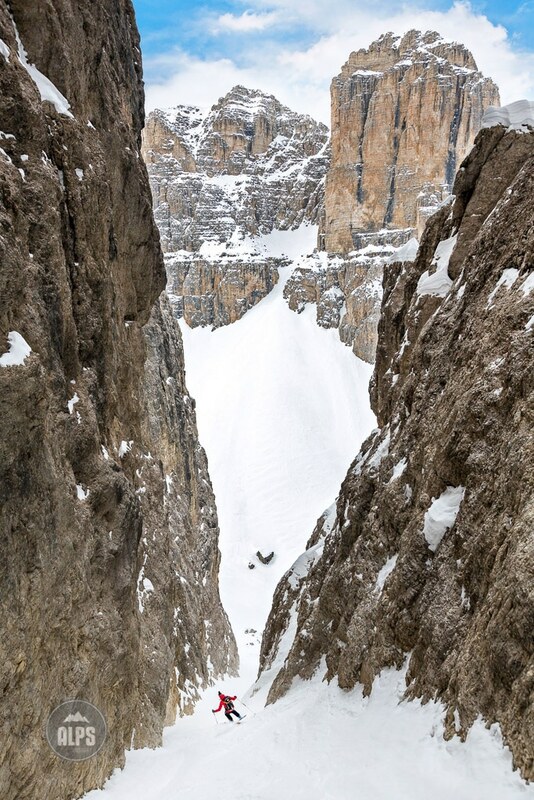 Looking down the barrel of the frighteningly steep and intimidating Holzer Couloir, in the Sella Group. Great post and awesome pictures, hope to get a a go at one of those culoir soon. Keep posting. Sorry if this seems picky, but do you really think of Val Gardena/Gherdëinia as a German-speaking valley? It seems pretty Ladin to me, and I got a lot of smiles from the locals with a bon dí. No doubt, almost everyone is also fluent in German. Non-natives seemed equally likely to be from elsewhere in Italy and working in the tourist trade as from a German-speaking part of the Süd Tirol.